Here’s a great new game from Yggdrasil Gaming here on Easyslots.com. Everyone’s had those dreams about how it would feel to be a Rock n’ Roll star, to stand centre stage in front of thousands of screaming fans as you strum your electric guitar and belt out the lyrics of your favourite tune. Well, Yggdrasil have their very own Rockstar and he goes by the name of Ryan. Ryan is an Irish leprechaun who lives the ultimate Rockstar life, he made his name years back and is known for his musical talents especially in his native Dublin. His musical persona isn’t his only profession though, Ryan is renowned for his lucky ways in helping you players out there get what you really want. He is prepared to make all your dreams come true as you jam your way to cash prizes on the big stage! Yggdrasil, a brand that now falls into the gaming gods category. The developer’s rapid growth of online slot games is never ending with every game they produce seemingly adored by all players. They have created a variety of content that suits all tastes, the diversity of high-quality games that they have live are packed with a bunch of different winning ways, stake ranges and featured bonuses. Not forgetting all their wonderful creative themes! 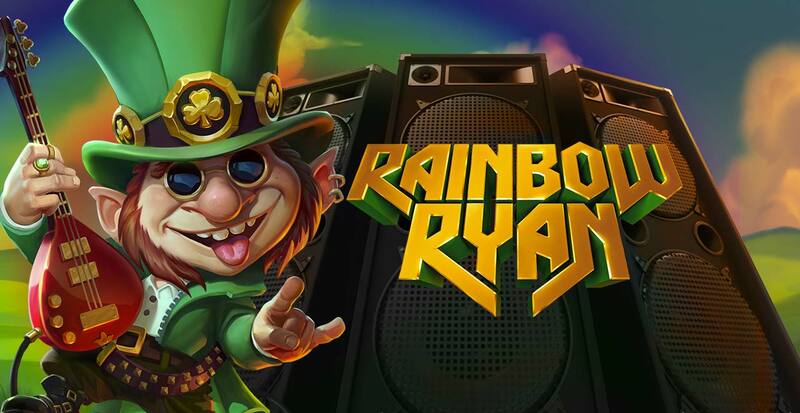 Rainbow Ryan is a classic example of what Yggdrasil are all about, taking two different themes in Ireland and Music then putting them together to create a character and theme that works so well, find out more games by them here. Join today and learn how casino by mobile works! Rainbow Ryan rocks the four card suits on the reels – Spades, diamonds, clubs and hearts. As well as the typical Irish/leprechaun theme symbols such as the lucky hat, microphone, boots and beer. I suppose one of the many standout features of this game is the huge 4069 ways to win, such a big number for a small man! With a fantastic range of ways to win, it makes up for the limited bonus features that the game includes, however, the limited bonuses are still extremely rewarding. Rainbow Ryan’s Wild symbol is simply the word ‘WILD’ it appears in a golden polished font, with an Irish green backdrop. 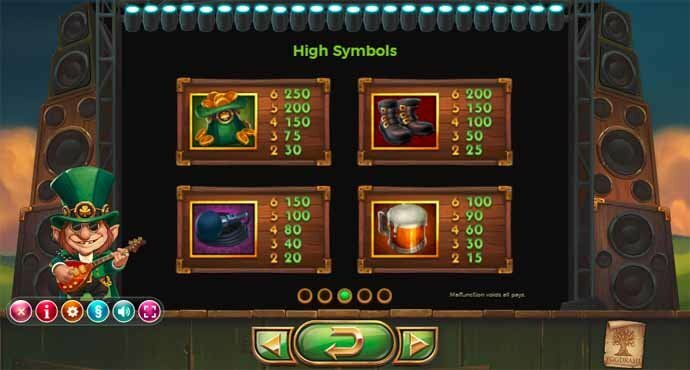 The Wild symbol can replace all the symbols on the reels besides from the Scatter symbol. Rainbow Ryan also has a Rainbow Reels feature, this will trigger at random times in the game by leprechaun himself. This can be between 2-6 reels displaying the same symbols. This happening will boost the probability of gaining a winning combination significantly. 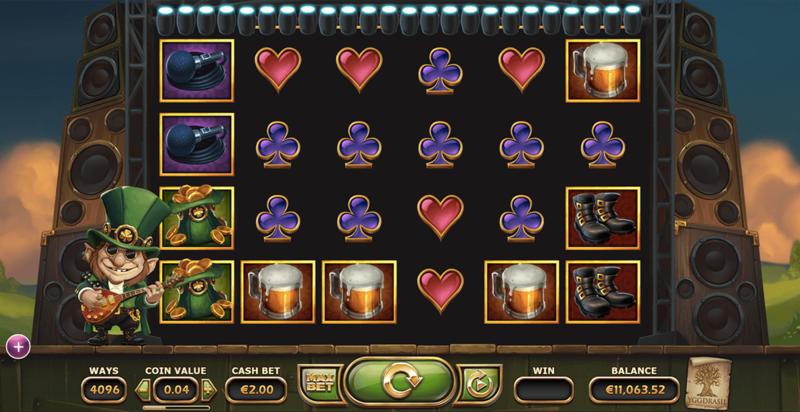 To sum this game up, you have a classic Irish themed slots game with a Rockstar twist. The game is accompanied by a little leprechaun who loves the Rock n’ Roll scene just as much as he loves winning you money! If you liked Rainbow Ryan you might also like to try other Easy Slots game.